It's time for another year of A Pinterest Christmas, where a few fellow bloggers and I post our favorite DIY projects based upon pins we've collected throughout the year(s). We're in no way associated with Pinterest other than using it as a source of inspiration...a bit of Pinspiration, if you will. Now, if you're not already sitting, you might want to have a seat because I have a lot of Christmas projects to send your way this year. 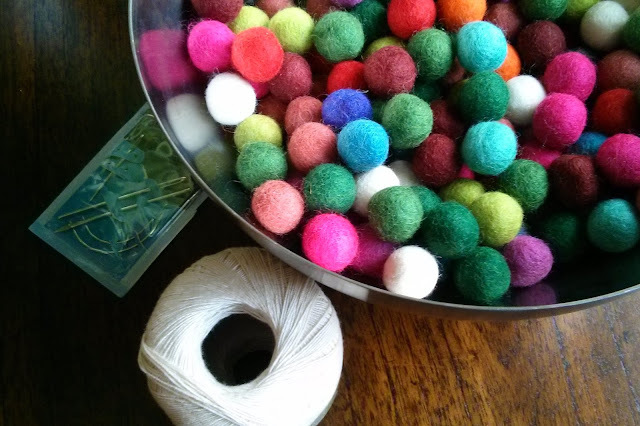 This is a suuuuuuper simple project that requires felt balls, some string (I used a soft bamboo string, but any sort of string or even embroidery floss should work), and a needle with an eye big enough for the string you've chosen. You could make your own felt balls, or you could cheat. I ordered my balls from Ornamentea in October and received amazing service and good prices (ordered Sunday night and received on Tuesday with free shipping and a BOGO special). So, I cut the tangled strings and started from scratch, putting the balls right next to each other on the new garland. Even with all that drama, I have less than an hour in this project all together. 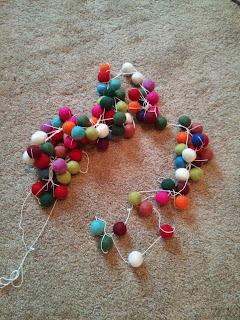 I'm already itching to buy more felt balls to double our garland for next year. The lower quadrant of the tree is decorated with toddler-safe ornaments, which get ripped from the branches as often as Madeleine enters the room. My "gently touch with one finger" rule has been a raging failure to say the least. Before the great tangle disaster of 2013, I used some "extra" felt balls to make a garland to drape over a canvas that hangs above the fireplace. This canvas was used to stage our old house, then covered with a shower curtain last Christmas, and now (three coats of spray paint and a few painted letters later) carries this happy little Christmas lyric into our house. Be sure to check out Kendra's take on felt garlands as well! And what about you? 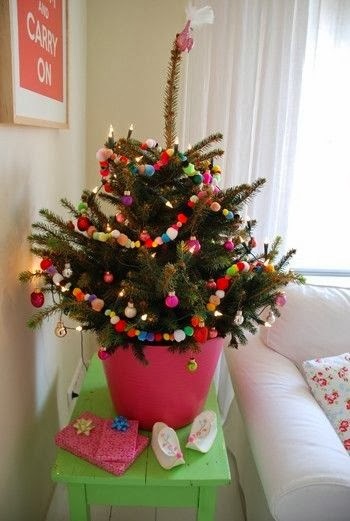 What are you wrapping around your tree this year? Want to see the rest of this year's projects? Even I want to squeeze these. How cute!